In embossed metal tin with card slipcase and gatefold insert. Track 2 - Published by fabric Publishing. ℗ 2010 Hotflush Recordings. Track 3 - ℗ 2007 Dynamic Tension Recordings. Track 4 - Published by Dirty Planet Recordings. ℗ & © 2010 Dirty Planet Recordings. Track 5 - Published by Copyright Control. ℗ 2009 Apple Pips. Track 6 - Taken from FSG002. ℗ Forward Strategy Group. Track 7 - Published by Theory. ℗ 2010 Theory. Track 8 - ℗ 2007 Dynamic Tension Recordings. Track 9 - Published by M-Plant Music / BMI. ℗ 2009 M-Plant. Track 10 - Taken from Planetary Assault Systems - Remixes (Ostgut Ton 31). Published by Mute Song UK. ℗ 2009 Ostgut Ton. Track 11 - Published by UL PUblishing. ℗ 2010 Underground Liberation. Track 12 - © Yell Music Ltd. ℗ 2009 Digital Distortions. Track 13 - Published by Copyright Control. ℗ 2010 Atom River. Track 14 - ℗ 2005 Dynamic Tension Recordings. Track 15 - Published by Warp Publishing. ℗ 2010 Opit Records. Track 17 - Published by EPM Music. Licensed courtesy of Blueprint Records. Track 18 - Published by News Publishing. ℗ 2009 Music Man / N.E.W.S. Track 19 - Published by Ancient Methods / Hardwax. ℗ 2009 Ancient Methods. Track 20 - Published by Copyright Control. ℗ 2010 Dynamic Tension Recordings. Track 21 - Published by Copyright Control. ℗ 2009 Apple Pips. Track 22 - Published by fabric Publishing. Licensed from Planet Mu Records Ltd. ℗ & © 2010 Planet Mu Records. Track 23 - Published by fabric Publishing. Licensed from Planet Mu Records Ltd. ℗ & © 2010 Planet Mu Records. Track 24 - Written and produced at HPHQ Stockholm. Remixed at Spacestation Ø UK. Published by Copyright Control. Track 25 - Published by Copyright Control. ℗ 2010 Dynamic Tension Recordings. Track 26 - ℗ 2009 Sonic Groove Records. Track 27 - Taken from isp002. Distribution by S.T. Holdings. ℗ 2009 If Symptoms Persist. Track 28 - Published by EPM Music. Licensed courtesy of Blueprint Records. Track 29 - Licensed by We Play House Recordings / Ferox Records. Copyright Control 2010. Track 30 - Published by Lunar Disko Records. ℗ 2009 Lunar Disko Records. ℗ & © 2010 fabric records. I'm not crazy about the dubstep bit in the middle or the lame cover art but everything else was as I would expect from the guy who made minimal techno more popular then jungle in New Jersey. This is a good mix. My favorite tracks are "Crab People" and "Klonk Part 1", both of which are outstanding melodic techno. Surgeon very conspicuously includes some dubstep such as Starkey's "Stars". It's a nice change of pace. While the track selection is all right, the mixing is excellent. Surgeon skillfully layers and blends together about thirty tracks onto one disc. Excellently selected and made into one living breathing masterpiece. One of the best mixes. It's kind of risky for someone to make a mix compilation for Fabric with very 'main' obvious tunes like it is for him when he is amongst the most sophisticated dj/producers on the planet. But he made it. This mix cd is main and obvious but still very very sophisticated indeed staying true to what he represents. Love it! Scalpel precision. When can I get an appointment, Doctor? that's at least a really good mix I must say. how does he blend them like that? I especially like a brilliant part consisting of these three: Surgeon – The Crawling Frog Is Torn And Smiles, Orphx – Threshold (Substance Mix), Gatekeeper – Blip. that mix is just essential in all ways, but particularly in mixing - this is REALLY perfectly structured and smart one. 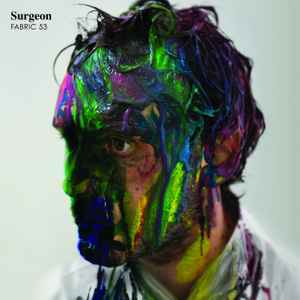 The Fabric 53 mix by Surgeon is one of the pearls. It was like a relief for me when I started to feel somehow bitter due to the flood of average stuff. You know those sets that send sweet shivers down your back and force you to smile from passage to passage? This is one of them. Put on your finest headphones and play it loud. True balm for the soul if you want Techno. Many people have been asking what relevance mix cds have on the electronic music landscape recently with the proliferation of high quality downloadable mixes from artists and magazines (for example: the Autonomic podcasts, Resident Advisor's podcasts, and FACT Magazine's podcasts). Where many mix series have faded into obscurity, the Fabric series remains and continues to release quality up to date releases which are better than any downloadable mix you will find. This is one of those mixes, incorporating more classical techno numbers with more modern yet to be classified electronic compositions, this mix is easily my favorite that came out in 2010. While many may prefer the Optimo fabric mix over this for its raw eclecticism, I prefer this one because as soon as you hear the recording of the train departing the station in the beginning you know that you are about to embark on one hell of a ride which is something all of the best mixes take you on. Ah where would the world be without the surgeon. The music that he has created and influences that he has made leave little to the imagination from a man who is as talented as him. This is of no difference typical surgeon style slow build ups and pouncing when you least expect it. A true leader in the world of techno.